CES is like Ninja Warrior for bloggers, a vast, obstacle-strewn arena where cell service is rare and usable internet is as uncommon as good hygiene. 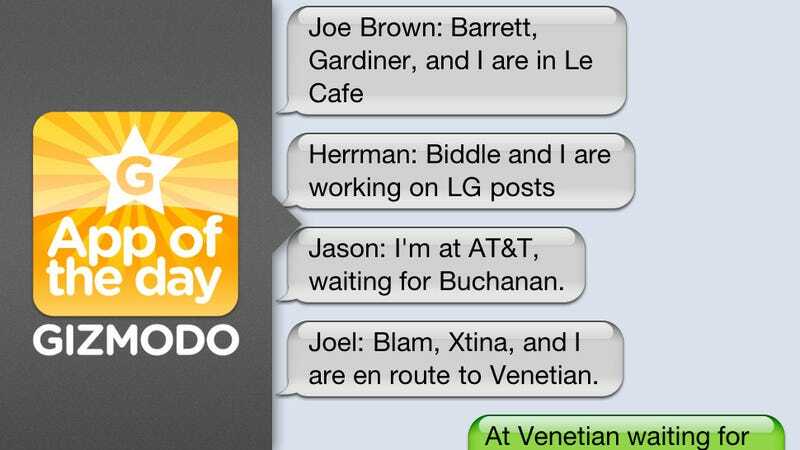 To stay in touch, Gizmodo relied on GroupMe. It worked and then some. The idea is a simple one: a reliable group SMS service, where every message is preceded by the name of the person who wrote it, just like a chat room. People with iPhones can turn on a built-in group MMS option which works pretty well, but that's just for iPhone users. GroupMe lets anyone with a texting plan get involved, and it was nothing short of our CES lifeline. And conga line. The app itself is kinda immaterial—you can set up your group and manage it through it or the service's website—though it does let you share photos with the group, which you can't do otherwise. But the meat of GroupMe goes down right in your regular old messaging app. When you start, you and your friends get a unique group phone number—all texts are routed through those digits, with the name of the person who sent each message attached at the front. Call the number up and you initiate a conference call with everyone in the group. There's really not much to it! But the simplest solutions are usually the greatest ones. It was utterly indispensable on the show floor. We all had our assignments going into CES, but of course there are countless audibles when you're actually there in the slop, and GroupMe was perfect for coordinating all the last minute switch-ups. More than email or AIM or our usual group chat client, GroupMe became the go-to way to stay in contact at CES. It was nothing short of our mobile office. Roaming the floor and see something cool? GroupMe to see if anyone else had already posted on it. Trying to figure out where everyone's camped out? Consult GroupMe. Drunk and feel like bothering the rest of the team? GroupMe. If that last bit sounds funny, well, it was. Really funny. Text messages are informal by nature, so you don't do much thinking before firing one off. And we fired off a lot. Like a lot a lot. Sure, sometimes receiving forty text messages' worth of vibrations in like a three minute period got a little bit annoying, but some of the best laughs I had at CES arose from GroupMe texts. Like when Matt informed everyone, with authentic frustration, "Jesus Christ. I can't find my way out of the flamingo." Or when Joe alerted us that he was getting "Waffles with g-unit." I figured he meant Giz features wiz Bryan Gardiner. He meant the actual rap crew G-Unit. Sam: "can you sum up the iliad in a sentence?" Joe: "a portable hive-mind optimized for the badwidth wasteland that is Las Vegas"
Rosa: "GroupMe was the best and the worst thing that could've been handed to our team." Barrett: "My pants have never vibrated so much in a 72-hour period. Almost never." Spratt: "It was like being inside of a text message version of the movie The Hangover." Chris: "Extremely useful work tool but an even more entertaining group messaging."